Situated 62 miles (100km) off the coast of northeast New Zealand, Great Barrier Island is a paradise of unspoiled wilderness and beautiful vistas found nowhere else in the world. While mining and logging were once thriving industries, the bulk of the island has been given over to nature reserves and the local ecosystem has thrived. Birdwatchers will be particularly thrilled to see rare creatures like Brown Teal Ducks, Black Petrel seabirds, and North Island Kaka Parrots. 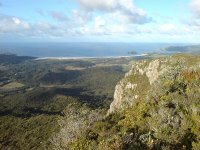 The real attraction of Great Barrier Island lies in the multitude of outdoor activities however, including scuba diving, sailing, kayaking, surfing, fishing, hiking, quad biking, mountain biking, and golf. The population of Great Barrier Island is only around 850, but there are still some good restaurants and lodges for visitors to enjoy.